Calling all volunteers and people who don't mind getting dirty outdoors! 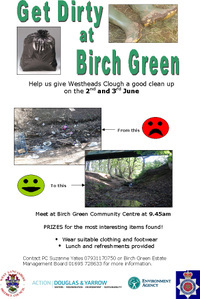 Join us in a bid to rid Westheads Clough of bikes, bottles and beds. This clough is in serious need of a clean up and we need your help! Click on the poster below or here for more information. Eric Arthur Blair, better known by his pseudonym George Orwell wrote some interesting books, yes we all know about Animal Farm and 1984 his most famous novels! In 1936 he was commissioned to write an account of poverty among the working class in depressed areas of the north of England. He toured Lancashire and Yorkshire and wrote 'The Road to Wigan Pier'. Below are some quotes from the book, which I found lurking in a folder on my computer. I like them and I hope you do too!